The return of 'house sized' apartments has put the Gold Coast prestige apartment market on track to match or exceed its record sales performance in 2015. Sales of million dollar-plus apartments reached a six-year peak in 2015, with 303 settlements recorded along the coastal strip from Main Beach to Coolangatta, according to the latest Urbis Gold Coast research. By June 2016, 165 prestige apartment sales had already been recorded, putting the prestige apartment market on track for another stellar result by the end of this year. The report showed an increase in the number of high-end off-the- plan apartments with floor space comparable to or larger than an average new Australian home, which according to ABS and KPMG statistics is 223 square metres. 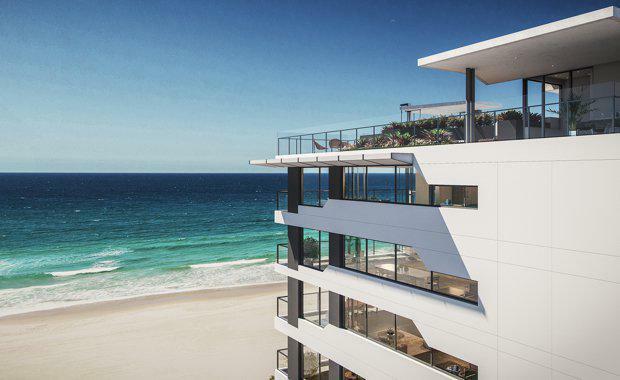 Developers like Reed Property Group, which is developing the beachfront Astoria project in Broadbeach, are capitalising on buyer demand for larger apartments. Reed Property Group CEO Jay Emmerton says the developer amended its approval for Astoria to allow for the project's apartments to increase in size from one and two bedrooms to the current two and four bedroom floorplans. 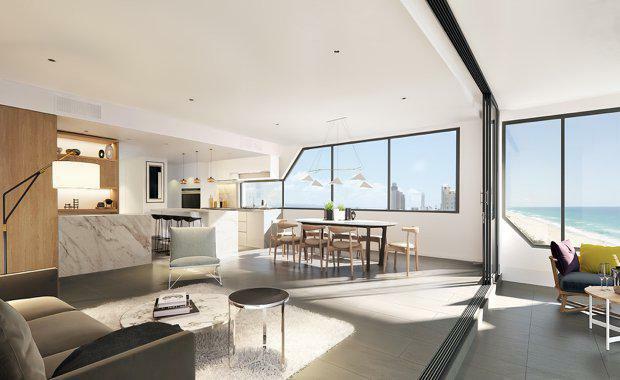 Astoria's four bedroom apartments offer 288 square metres of space, while the penthouse atop the building boasts a 414 square metre floorplan - almost double the size of the average new home. Astoria by Reed Property Group"According to Urbis research, in recent years the majority of new apartments have been targeted towards investors and prestige apartments have focused almost exclusively on two and three-bedroom floorplans," Mr Emmerton said. "We are now starting to see demand for four-bedroom floorplans and full-floor apartments from buyers living in a large home who have been waiting to make the transition to a house-sized apartment. "Buyer interest has also been based on the fact that Astoria is a mid-rise boutique development, with just 16 half or full floor apartments, so it is more akin to living in a home. Astoria sales agent Andrew Bampton said the Urbis report showed buyer demand supported activity levels in the region and the overall median price of Broadbeach apartments remained at a premium to the wider Gold Coast. "According to the latest Urbis research, at the end of June 2016, six active new apartment projects in Broadbeach had a total of only 118 apartments available for sale," Mr Bampton said. "The reason the market is keeping pace with new development in Broadbeach is because there is a wide variety of apartment types on offer and it's not crowded at the top end, with only one prestige beachfront development. "During the June quarter 2016, the overall weighted average sale price for new apartments within the Broadbeach region was $703,412, which is considerably higher than the overall Gold Coast weighted average of $579,997. "Broadbeach's continued growth is being driven by billions of dollars of new infrastructure, including the $850 million Jupiter's Casino and Hotel expansion, the $670 million Pacific Fair Shopping Centre upgrade and an array of improvements to local road and pedestrian and parks. "Statistics show baby boomers and retirees will make up 37 per cent of the Gold Coast's population by 2036, so well located, boutique and spacious apartments like Astoria are expected to appeal to the city's increasing number of downsizers over the coming years."